A.A. Milne's Winnie the Pooh series of books and poems remain my favorite children's stories. Perhaps it's because I find bits of wisdom for my adult life in these classic children's tales. More often than not I wake up thinking about what I have to get done during the day, or what I have to do but am not looking forward to. But in this little excerpt I'm reminded that each day I need to rise with excitement about the possibility of the exciting moments that could happen. One of my pre-kindergarten students reminds me of this. Everyday for the first several months of the school year he always had a Pop-tart in his lunch box for snack. Though it was an everyday occurrence, he never failed to open his lunch box with pure excitement and joy and exclaim, "I got a Pop-tart for snack today!". It was as though each day was the first day he got this special treat. Everyday can hold hundreds of tiny miracles and moments of joy, but I often let myself become too busy to notice. 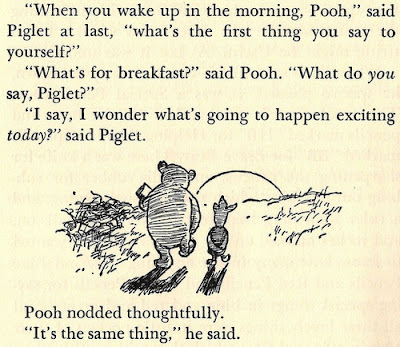 I think if I had the attitude described in this Winnie the Pooh story and exhibited by my Pop-tart eating student more often I'd be open to notice the exciting moments everyday, rather than letting them pass me by as I remain wrapped up in my to-do's. How do you take time to slow down and recognize the joy in everday?